This is two of the guys from the Danish rock band Causa Sui doing old school electronica stuff with their friend Rasmus. It is released on the Scottish Label Benbecula. It has a really cool and unique packaging and is released in only 500 copies. This is not techno or shoegazer, this is going straight back to the early days of Cluster, Tangerine Dream and Terry Riley. Analog synths and drum machines, mostly improvised but some parts sketched out. Jonas plays some very cool highly effected guitar drones and effects, as well as some of the pieces build up (Zenith). Open Plains is a short piece that leads right into Zenith. Zenith is a totally killer track that you just get totally taken away with and has great spaced out sounds and a killer hypnotic groove and it is totally fast and spaced out at the end of the 12 minutes. Amazing stuff. 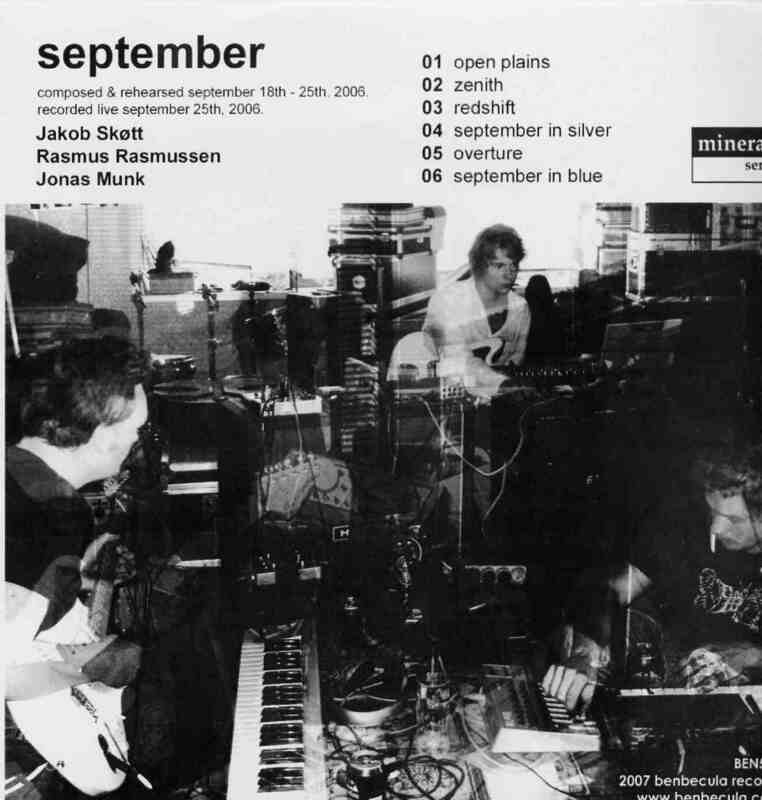 Next is another 3 minute spacey ambient piece of music that leads into September in Silver with a cool bass line over which the layers begin but this one really takes off into almost stuff like space rock with some real melodic elements. After the short ambient synth overture, the real major work of the CD, September in Blue, takes off for 24 minutes. It is based on some very repetitive synth and guitar loops as the track slowly gains momentum.